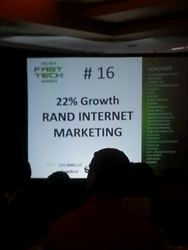 FORT LAUDERDALE, Fla. / October 28, 2014 - Rand Internet Marketing has been recognized in this year’s Fast Tech Awards as one of the fastest growing technology companies by the South Florida Business Journal (SFBJ). The Fast Tech Awards acknowledges companies that are making their mark on this ever-changing industry. Companies are ranked by percentage growth of annual revenues from 2012 to 2013. These awards are presented to companies based in South Florida that create advanced technologies, provide IT solutions and services to businesses, and achieve positive results for clients. “We attribute our growth to the hard work of our staff, the loyalty of our valued clients, and the success of our web design, web development and internet marketing efforts on behalf of our clients,” said Seth Rand, Founder and CEO of Rand Internet Marketing. The 2014 Fast Tech Awards were presented at an event held on Oct. 23 at the Hyatt Pier 66 in Fort Lauderdale. These awards were sponsored by Comcast Business, Daszkal Bolton, Florida International University College of Business, Synechron, and TriNet. Rand Internet Marketing, a division of Rand Business Services, offers professional design and marketing services including logo design, graphic design, website design, web development, search engine marketing, and social media marketing. Rand specializes in professional responsive web design and development including WordPress websites and Magento e-commerce websites, mobile site design and development, search engine optimization (SEO) and pay per click (PPC) marketing. Rand also offers video production, printing, reputation management, photography, merchant services and a variety of other professional business services.